Have you ever worked on a painting, 3d render or shot a photograph and it turned out looking like the subject was a toy instead of something bigger than life? I’ve seen some images made by people where you say, hmm… sure looks like a toy to me – and it wasn’t intended to look like a toy. I had a render of my Mclaren automobile that looked like it belonged in a toy box. What went wrong. Well maybe this will help a bit. It turns out that you can make reality look like a miniature set or a bunch of toys! The trick is to add a lot of depth of field effect (blurring the background and foreground). Add a high angle and voila… miniatures! These people do it on purpose, now I know what I can do to avoid it. 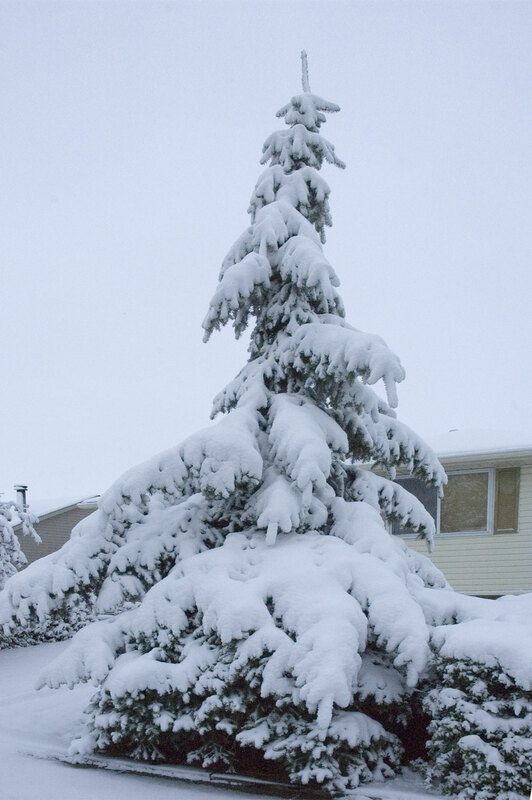 A couple of days ago we had a nice spring snow fall so I took this shot of our neighbor’s tree. I think it makes a good reference shot (especially for those of you who don’t get the benefits of snow in those milder climates). Of course all the snow is gone now and it’s quite warm (24C or around 75F). If you click on the image it will load the larger version (about 225kb). 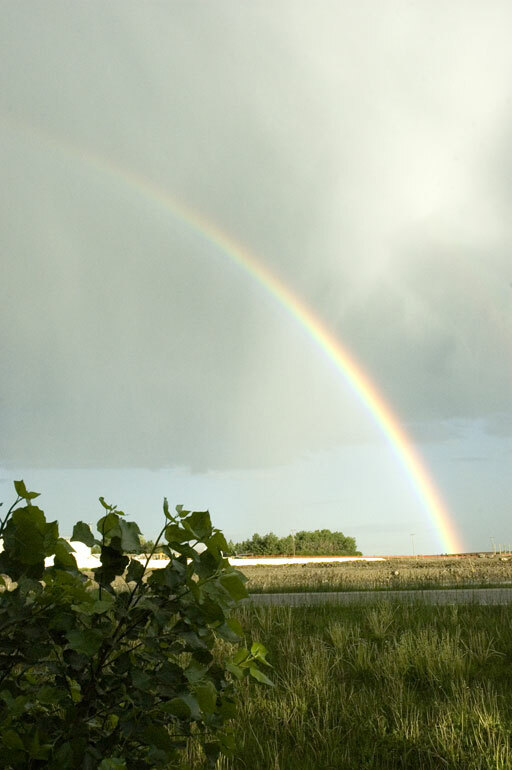 This beauty was part of a double rainbow seen out the same direction as the lightning shots below. You can sort of see the second rainbow off to the mid right of the main rainbow. An interesting thing I noticed after taking this shot was that the sky to the right of the rainbow is darker than to the left. It almost looks fake. *”This is the sign of the covenant I have established between me and all life on the earth” – Genesis 9:17. Here are some photos I took at around 2:00am last night. A bit of a storm pushed through our area and so we enjoyed the light show for about an hour. So instead of trying to sleep through the thunder and lightning, I grabbed my Nikon D70 propped it up on the headboard and took a bunch of photos out of our bedroom window. The trick was to keep the focus, catch the lightning and keep it steady. Having it on top of the headboard I placed the lens hood right against the window – that made a makeshift tripod which took care of the steadiness problem. In order to capture the lightning I took a lot of 2 to 4 second exposures at bulb setting one after the other… I just opened the shutter then counted 1 to 4 (or so) let the shutter close and immediately opened it again. After about 20 shots I went through and deleted any images that didn’t work out (of course this was when the neatest lightning decided to strike). For focus I set the focus at infinity – well actually just a little before the infinity symbol (play around with your camera during the day to know exactly where the actual infinity focus is – it varies from camera to camera and can be a little bit before or after the infinity symbol). The wonder of digital cameras! This morning I marveled not only at the pictures and awesome wonder of lightning, but that I could actually do all those things half asleep! Last summer I had some time to stay up late and take some astrophotographs. 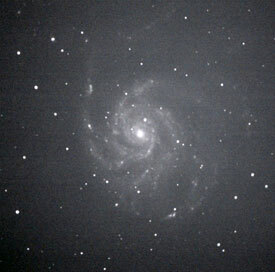 This is my first attempt at taking a picture of M101 galaxy. In astrophotography the exposures have to be quite long (compared to regular standards) and this, coupled with the fact that the earth spins, makes it quite tricky. It means you have to keep the telescope/camera assembly pointed at the right part of the sky for the length of the exposure. I used a digital camera for the shot, but due to the ‘noise’ that develops from the CCD (the electronic version of film) you are limited to the length of the exposure. The solution is to take more, shorter exposures and ‘add’ them together in something like Photoshop. My tracking is off a bit (the stars aren’t exactly round) and that is partly due to the poor quality of my telescope mount (donations for a new fancier and shmancier mount are gratefully accepted ). If you want to see what the Hubble space telescope sees when it looks at this galaxy, check out this page. I downloaded the high resolution image and it’s now my background on my dual monitor setup. It’s breathtaking and my image is nowhere near the quality of this amazing mosaic. It’s been a week and I haven’t posted anything… it’s really been a week? Wow. I’ve been knee deep in projects and that is good. Some pretty cool stuff I get to work on, but unfortunately I can’t talk about – at least not yet. Anyway, on a side note… here is a composite image I created last year when the earth cast a shadow on our moon. 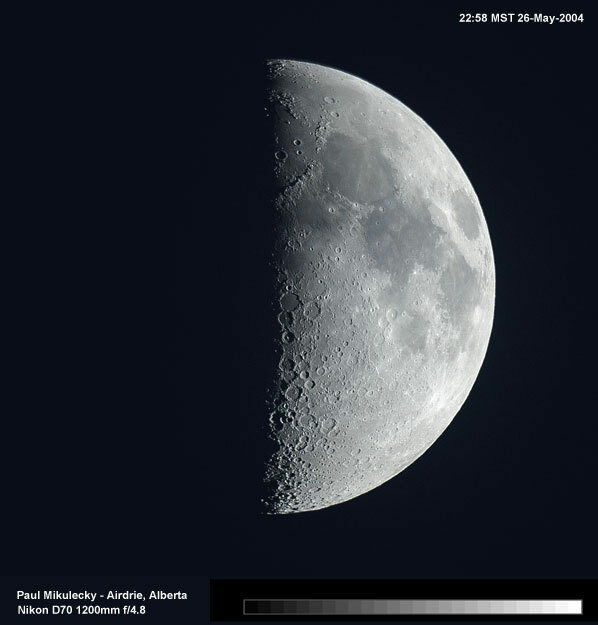 Boy I miss going out with my camera and telescope (it’s been too busy, cold and cloudy)…. too many interests and so little time. I think I’m starting to envy Methuselah’s life span!